To all who celebrate it . . . There's nothing like sending postcards before you've even left the country :-) . I am hoping to fly to Luxor today although we are inevitably psyching ourselves up to spending the night at Terminal 3 thanks to the snow and ice. Oh joy. My house is surrounded my snowmen built by local residents, which are really pretty but something of a bad omen for travel! Assuming that we actually get to Luxor I understand that there will be WiFi but just in case something goes wrong, this is just a quick message to say that I am not back now until early January and may or may not be sorting through emails or updating the blog between now and then. I'll find out when I get there so watch this space and if nothing happens please be assured that I'll backdate the blog when I get back to London, and reply to my emails too. When we get back, assuming that we ever leave, my house will have been redecorated by a friend of mine who is house-sitting for me - scary to return to a new look interior! I picked out all the colours but you never know what it's going to look like until it is on your ceilings and walls. Thanks Terry - and don't party too hard until the paint is dry!! I hope that those of you who celebrate it are ready for Christmas and that everyone has prepared a big list of all those New Year resolutions that most of us never manage to keep! In the mid 1850s W H Bartlett visited Egypt and travelled down the Nile by boat. He recorded his impressions in a book called 'The Nile Boat or Glimpses of the Land of Egypt'. The plates in the book where engraved from his own drawings except for the material from Abu Simbel which he did not reach due to illness. The plates here are reproduced from a fifth edition of the book published in 1862. Many thanks to Jon for a great batch of photographs and for his permission to use them. Two red granite statuary fragments of King Amenhotep III were unearthed this week at Amenhotep III’s (1410 – 1372 BC) mortuary temple on the west bank of Luxor. Minister of Culture, Farouk Hosny announced that these objects were found during a routine excavation carried out by an Egyptian team on the northern side of the temple. The team has been working to uncover the ruins of the funerary complex, which was once the largest temple in ancient Egypt. Unfortunately, during the Late Period, the temple was destroyed and its blocks were reused in the construction of other temples. Dr. Zahi Hawass, Secretary General of the Supreme Council of Antiquities (SCA), explained that the first newly discovered artifact is a 2.73m tall head of the god Hapi. Hapi was one of the four sons of Horus and is depicted with a baboon face. The second object is a fragment of a larger statue of King Amehotep III, which features two legs that measure 30cm tall. Excavation is now focused on unearthing the rest of these statuary fragments. Due to the large number of statuary found in this area, Hawass believes that the northern side of the temple may have served as a burial spot for broken and damaged statues. Coincidence has always played a major role in the discovery of great ancient Egyptian treasure. Among famous examples are the uncovering of the tomb of Tutankhamun in Luxor, the funerary collection of King Kufu’s mother Hetep Heres, the pyramids builders’ cemetery at the Giza plateau and the Valley of the Golden Mummies in Bahariya Oasis. This time coincidence led to the discovery of a cachet of King Amenhotep III (1410–1372 BC) statues along with numerous ancient Egyptian deities. During a routine excavation on the northern side of the King Amenhotep III mortuary temple to uncover the ruins of the funerary complex, which was once the largest temple in ancient Egypt, Egyptian excavators unearthed two red granite statuary fragments of the king and god Hapi, one of the four sons of Horus. The first newly discovered artefact is a fragmrnt of a larger statue of King Amenhotep III, which features two legs that each measure 30 centimetres tall. The second is a 2.73 metre tall head of Hapi depicted with a baboon face. Sadly, during the Late Period, the temple was destroyed and its blocks reused in the construction of other temples. Today, Dr. Zahi Hawass, Secretary General of the Supreme Council of Antiquities (SCA), inaugurated the new Development Project of the Egyptian Museum in Tahrir Square. Minister of Culture, Farouk Hosny announced that the project’s aim is to provide more services and facilities to the museum’s patrons, which will include adding a new visitor’s route and extending the hours of operation until 10:00 pm. The museum is now equipped with a brand new visitor’s center that includes a beautiful bookstore, cafeteria, restaurant and a children’s museum. This center is located on the western side of the Egyptian Museum and will be accessible through the museum’s new tour route. Dr. Hawass also will announce the opening of an open-air permanent exhibition on the eastern side of the museum. The Ministry of Culture opened a bid early this week for the four specialised companies that won an international competition to carry out the third and final phase of the construction of the Grand Egyptian Museum (GEM). This phase includes the construction of the museum's main building and its inner galleries. Culture Minister Farouk Hosni expects that the construction work, which will begin in February following approval by the Japan International Cooperation Agency (JICA), sponsor of the GEM, will last for 26 months. He says that in order to choose the best and most qualified company for the GEM's construction, bid files will be distributed among the four chosen companies to be studied and to help them in proposing their offers. In June this year, in partnership with JICA, the first two phases of the project -- including a power plant, fire station and fully-equipped conservation centre with 12 laboratories and four storage galleries -- were launched by Mrs Suzanne Mubarak. Hosni described the museum as a mega project for Egypt, one of the "world's most ambitious projects" and "the museum of the century". Excavating ancient houses in the Nile Valley typically yields masses of pottery, simple stone tools and other modest objects. Though unspectacular, these provide an important insight into the technologies, dietary customs and even religious beliefs of the ancient inhabitants, and sometimes help tell us how different spaces were used. Occasionally, however, a more spectacular find appears. Last season, digging the back room of a narrow three-roomed house dating to the time of Ramesses III or shortly after (around 1150 BC), the windblown sand parted to reveal a small sandstone bust of a male figure, still perched atop the pedestal constructed to support it. Last week Cairo's Saliba Street was even more crowded than usual. Cars by the dozen edged their way through the hundreds of pedestrians swarming in the street to buy and sell goods. However, around the corner in the Suyufiya alley just off Saliba Street, where the Mamluk Palace of Al-Amir Taz is situated, the atmosphere was serene and enchanting. Soft Oriental tunes filled the evening air of the open court at the centre of this vintage palace and a light winter breeze frisked the softly-lit trees and foliage. . . . The museum was founded in 1910 by an influential Copt, Marcus Pasha Simaika, who created it as a permanent home for some of Coptic Egypt's heritage artefacts in a building next to the Hanging Church in Old Cairo. The Coptic Art Museum was renovated by the SCA and reopened to the public in 2006. Britain's most family friendly museum will be welcoming a new type of mummy into its family next year when Secret Egypt opens at the Herbert Art Gallery & Museum. From 11 February to the 5 June 2011, this brand new exhibition will adventure into and challenge the secrets and myths about ancient Egypt perpetuated by Hollywood and popular media. Secret Egypt will bring together over 200 objects from museums around the UK including a mummy from the 22nd dynasty on loan from the Manchester Museum. The mummy, called Perenbast, was discovered in 1909 in Qurna, Egypt and is a great example of the care and respect given during the preparations for passing into the eternal life. “Archeological Discoveries” were on the menu for the Hi-Desert Nature Museum’s November Brown Bag Lunch lecture. Museum Supervisor Lynne Richardson introduced an assortment of characters, from the “antiquarians” of the 19th century to 1920’s Indiana Jones prototype Roy Chapman Andrews. Many well-to-do Europeans were traveling and collecting treasures in the early 19th century with no scientific organization, Richardson said. One of them, former circus performer and inventor Giovanni Belzoni, traveled to Cairo in 1815, where he was convinced that there was money in exporting antiquities to Britain. Thanks very much to Daniel Arpagus for the above link. Prof. Dr. Joachim Friedrich Quack, Director of the Institute of Egyptology at the University of Heidelberg and member of the Cluster “Asia and Europe”, has been awarded the Gottfried Wilhelm Leibniz Prize by the Deutsche Forschungsgemeinschaft (DFG). This was announced by the DFG on Thursday (2 December 2010). The award, which is the foremost distinction presented for research in Germany, comes with a purse of 2.5 million euros, with the purpose of financing future research projects by the Heidelberg scholar. Prof. Quack is being honoured as one of the “world’s most eminent Egyptologists from Germany”, according to the DFG. The Deutsche Forschungsgemeinschaft has announced four women and six men as the award winners for the year 2011. Prof. Quack is the sole recipient from the social sciences and humanities. The prize giving ceremony will take place in March 2011 in Berlin. For those of you who are following Keith's excellent series about pyramid construction the third part of his Hemienu to Houdin set is now available at the above address: Hemienu to Houdin: Phase One, Part C—The Inner Workings of the Great Pyramid of Khufu. The second revised and extended edition of the Codex of Ancient Egyptian Plant Remains is now available for order online from the publisher at Sais Books. Over 5300 identifications of ancient Egyptian plant remains. Taxonomical classification of identified species in the manner of a flora. Comparative analysis with modern Egyptian flora. Most complete bibliography ever published on the subject. Introduction and analysis in English-French. Thanks very much to Tony for bringing this sad news to my attention via his ArcheaoBlog and his very personal view of this remarkable contributor to conceptual thinking about prehistory. Dunnell's book Systematics in Prehistory, published in the 1970s at a time when theoretical archaeology was still evolving fast, was a landmark publication which took a Darwinian view of the past. 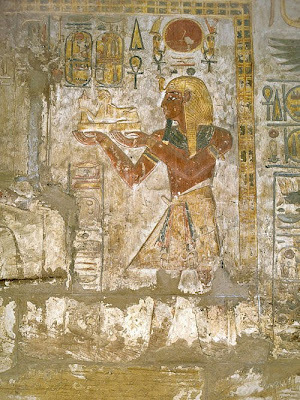 A relief with original colour in the Sanctuary of the Khonsu Temple. Medinet Madi is a lovely Middle Kingdom site in the Faiyum Depression. I've posted a number of photographs of it and items about it in the past. 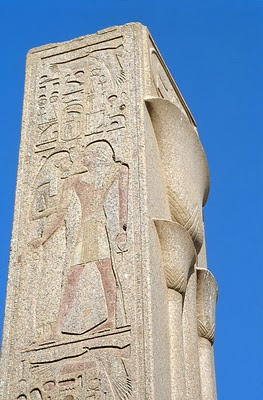 Just type Medinet Madi into the search engine on this blog to see photographs and links. Because it is remote it only receives a few visitors which means that every time that I've been there with friends we've had the place to ourselves. Photo copyright Bob Partridge, Editor of Ancient Egypt Magazine with my thanks. The project is a highly ambitious one whose results were recently examined at a conference held in Cairo . . . .
During the conference the importance of Italian and Egyptian institutions' experience and know-how was foregrounded, which were exemplified by the fruitful cooperation between the Italian University of Pisa and Egypt's Supreme Council of Antiquities, which led not only to recovery of the only Middle Kingdom temple in the country, with texts inscribed into the walls and relief works, as well as the restoration of the entire surrounding area, but also, and most importantly, its availability to visitors in full compliance with the defence of the environment and with major socio-economic returns. With some great photos and references for those who want to read more. Thanks to Per Storemyr for sending me the link. Historic photos are essential for research on monument weathering. With free internet access to archives, such photos are now easier to find than previously. In this article, I will show the case of Cleopatra’s Needle, a famous Ancient Egyptian obelisk transferred to New York in 1880. Its severe weathering occupied Erhard Winkler, a pioneer on the historic implications of monument weathering. But Winkler overlooked a key historic photo that would have seriously altered his interpretations. Thanks to Charles Ellwood Jones and the Ancient World Online blog for pointing me to the above link. This conference included an exciting array of demonstrations and talks, from flint knapping to flower arranging, from textiles to ship building, not to mention woodworking, stoneworking, manufacturing ritual clay artefacts, shipbuilding, antler bow manufacture, glassworking, an oral performance, and of course mummification! This conference was streamed with financial help from Swansea University Research Institute for Arts and Humanities. The videos can be downloaded by clicking on the name of the speakers. Another non-Egypt specific post, but of general interest to anyone concerned with conservation and related topics like restoration and vandalism in both archaeology and art. It aims to promote conversation on the subject. The blog is written by people affiliated to UCL and has only just kicked off so now would be a good time to help get it started with your opinions. Thanks very much to Kea Johnston for the link to Cairo resident Jean-Claude Aunos's photostream on Flickr. As Kea points out he is a professional photographer who has obviously been given permission to take some close-up photographs of subjects to which most visitors would not usually have access. 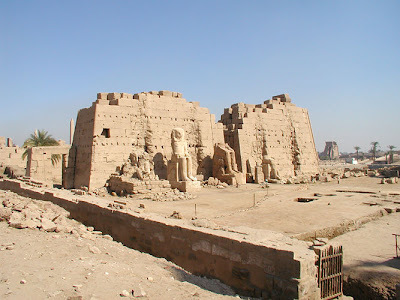 Many thanks also to Suuded from Germany for the link to his Picasa web pages with a huge collection of lovely photographs from Egypt's Nile valley. I really enjoyed them. 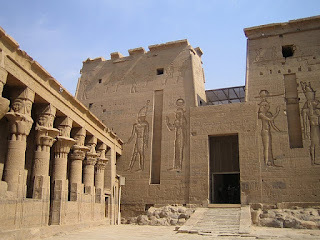 The photograph on this post, a shot of Philae, is one of Suuded's with my thanks for the permission to use it. Many thanks to Hans Barnard for this link. Sir Wilfred Thesiger took nearly 40,000 photographs during his eight decades of travels throughout Africa and the Arabian Peninsula. Now, to mark 100 years since his birth, Oxford's Pitt Rivers Museum is displaying some of his most striking images. For BBC Radio 4, the BBC's security correspondent Frank Gardner - who met Sir Wilfred several times - has been to the museum to see the photographs. Here - with the help of museum curator Christopher Morton and archive recordings of Sir Wilfred himself - he looks back at Thesiger's appreciation of desert communities and their ways of life. Thesiger at 100 will be broadcast on BBC Radio 4 at 1102 GMT on Monday 13 December 2010. It will then be available for seven days on the BBC iPlayer. For subscribers / for purchase only. A really good article about how humans endow everything with human attributes - including Egyptian deities. and my only excuse for posting about it is that today is a slow news day and the article has a photo of two Egyptian deities at the beginning! If you're interested in the human habit of anthropomorphising, this is a very good read. Thanks to Kat for picking this one up. As she says it is not specific to Ancient Egypt but it is certainly relevant. The University of Manchester has joined forces with Diamond Light Source, the UK's national synchrotron science facility, to produce a world-class imaging facility. This will allow researchers in a wide range of fields to create high-quality 3D images of samples including engineering components, biomaterials, fossils, organic materials and energy devices such as fuel cells. Due for completion in 2012, the X-ray Imaging and Coherence beamline at Diamond, I13, is designed for a broad range of scientific users from biomedicine, materials science, geophysics, astrophysics and archaeology. Its two branch lines – called the ‘imaging' and ‘coherence' branches – will provide tools for non-destructive examination of internal features ranging from the micro (a few thousandths of a millimetre) to the nano (a few millionths of a millimetre) length scale. The remains of the 10th pylon. Copyright Jon Bosworth, with my thanks. What Explains a Peaceful Greek Trade City in Ancient Egypt? Naukrtis, a Greek trade emporium in Egypt's Nile delta region was given special privileges by Egypt -- the Greeks who lived there, though from competitive tribes, lived and worshipped together in peace. Naukrtis, has long captured the imagination of archaeologists and historians. Not only is the presence of a Greek trading settlement in Egypt during the 7th and 6th century B.C.E. surprising, but the Greeks that lived there in harmony hailed from several Greek states which traditionally warred amongst themselves. Dr. Alexander Fantalkin of Tel Aviv University's Department of Archaeology is delving deeper into this unique piece of ancient history to come up with a new explanation for how Naukrtis developed, and how its inhabitants managed to operate on foreign soil and create a new sense of common identity. The Greeks that inhabited Naukrtis, explains Dr. Fantalkin, may have come from warring city states at home, but they formed a trade settlement in Egypt under the protection of powerful Eastern empires. This link not only brought them together as a culture, but explains how they were allowed to operate in the midst of Egyptian territory. Dr. Fantalkin's theory was recently presented at the Cultural Contexts in Antiquity conference in Innsbruck, Austria, and will soon be published in the proceedings of the conference. Following recent exhibitions of British orientalist painting in London and of the work of French orientalist painter Jean- Léon Gérôme in Paris, the Musées royaux des Beaux-Arts de Belgique in Brussels has had the good idea of mounting a Europe-wide survey of this intriguing sub-genre of European painting. Flourishing from the early decades of the 19th century to the early 1900s, when changes in taste and collecting habits rendered it almost extinct, in its hey-day many first-rate artists, and quite a few less exalted ones, tried their hands at producing orientalist paintings. The Brussels exhibition, entitled De Delacroix à Kandinsky, l'orientalism en Europe, shows how these included images of women in harems, picturesque ruins, slave markets and what for Europeans were oriental-looking types, all part of 19th-century European imaginings of the Middle East and all apparently snapped up by an eager international market. While the core of the exhibition is made up of work by French and English painters, perhaps unsurprisingly given these two countries' colonial interests in the Arab world, the show is also noteworthy for its pan-European focus, showing how 19th-century artists from Germany, Belgium, Spain and the then Hapsburg Empire also turned out a wealth of orientalist canvases, most of them reproducing similar ways of seeing the Arab world. Among the major lenders to Brussels’ alluring exhibition, From Delacroix to Kandinsky: Orientalism in Europe, is Doha’s Museum of Islamic Art. There is nothing Islamic, though, about the works visiting from Qatar. They range from a sweeping, translucent crater-like landscape, “Damas” by Edward Lear, and John Frederick Lewis’s intricate narrative, “The Love Message”, to Jean-Léon Gérôme’s polished “Armour Seller in Cairo” and José Villegas y Cordero’s “The Dream”. In this exquisitely finished, lavishly coloured work in loose, broken brushstrokes, a half-clothed Arab merchant sleeps among his rugs and cushions, still puffing on a hookah from which a whirl of smoke floats upwards to form the contour of a naked white girl. In its description of eastern sensuality, lassitude and an archaic setting resistant to modernity, “The Dream” is a textbook case for everything that Edward Said, in his far-reaching study Orientalism (1978), criticised about European fantasies of an exotic, decadent, backward Middle East. Such images, Said showed, were inseparable from western political, economic and cultural imperialism, and in the 30 years since its publication, Orientalism has shaped every interpretation of this decorative, embattled genre. Tate’s 2008 exhibition of Victorian oriental pictures, with extensive commentary by Islamic writers, was an excellent example. This article is written in rather broken English (though much, much better than my Italian!) but is well worth persevering with because it makes some very important points about the way in which dam-formed lakes use Palaeochannels to expand in ways which can threaten both the environment and the archaeological remains at the edges of the artificial lakes. The huge reservoir of the Merowe Dam on Nile River is featured in an image photographed on 5 October 2010 by a crewmember on the International Space Station . The dam is located near the Fourth Cataract of the river, in that part of Nubia desert where the Nile is creating its Great Bend, a contorted path of the river through the bedrocks of Bayuda Massif. Few years ago, the satellite imagery showed a fertile strip of land with many villages, where the paleochannels of the Nile hosted vivid green cultivated fields. With term "paleochannel", we call the old dry bed of rivers. Now, a huge part of this valley is under the waters of Merowe Dam reservoir that flooded villages, fields and archaeological sites. The Society is pleased to announce that the 2010 Centenary Awards for early-career researchers are being given to three very varied projects: to Jennifer Cromwell to study and publish non-literary Coptic texts in Copenhagen, to Kenneth Griffin to study The Book of the Dead from the Tomb of Karakhamun (TT223) and to Hélène Virenque to research Naville's early correspondence. Many congratulations to all three! I am particularly pleased about Jenny Cromwell's award, having watched and taken notes on her simply excellent seminar at the EES earlier this year, Coptic Thebes: Life in the 7th and 8th Centuries. Elena Pischikova wrote an article about the South Asasif tombs in the April/May 2009 issue of Ancient Egypt Magazine. Sometimes, a book does not need a long review to explain its importance. ‘Unseen Images. Archive Photographs in the Petrie Museum. Volume 1: Gurob, Sedment and Tarkhan’ is one of these. The volume is edited by Janet Picton and Ivor Pridden and dedicated to UCL’s Professor Harry Smith. Several scholars (Margaret Serpico, Wolfram Grajetzki, Stuart Laidlaw, Lucia Gahlin, Bettina Bader and the editors themselves) contributed to the volume, each of which is very familiar with the topic at hand. Making hidden archives available to the world is one of the tasks the scientific world should take more seriously than they currently do. In the age of the digital highway, the internet is of course the praised medium to do so. Perhaps the best example of this is the Griffith Institute’s website about the excavation of Tutankhamun’s tomb (http://www.griffith.ox.ac.uk/gri/4tut.html). Frustratingly, institutes are still reluctant to do so for whatever reason, seriously limiting the progress of scholarly and scientific research. The more surprising it is to see a real book with part of Petrie’s photo archive. When the campaign to restore Egypt’s stolen antiquities first began, the world – particularly the archeological community – was surprised by the force of our call and insistence that our stolen artifacts and heritage be returned to us. The initial rallying call for our antiquities to be returned to their homeland was made from the heart of the British Museum, after I was invited to give a lecture there. After the lecture, the museum curator invited British intellectuals and several politicians to a dinner that was held in one of the museums halls, where I noticed that a number of Egyptian antiquities were on display. Such antiquities included the magnificent statue of King Ramses II, the greatest Egyptian pharaoh of them all, as well as a statue of King Tuthmosis III, who has been nicknamed the "Napoleon of Ancient Egypt" as he is credited with expanding the ancient Egyptian empire as far north as Anatolia and as far south as the fourth Cataract of the Nile [Dar al-Manasir]. After dinner, the museum curator delivered a pleasant speech welcoming me to the British Museum; the curator also paid tribute to British-Egyptian relations in the field of archeology and praised the cooperation that exists between the British Museum and Egypt. The first ever locally curated exhibition on Coptic art was unveiled to the public yesterday, when the open courtyard of the Amir Taz palace in the district of Al-Khalifa hosted dozens of Islamic and Coptic religious leaders, official guests, journalists and photographers at the grand opening of the Coptic Art Revealed exhibition. On show are 205 artefacts from the Coptic Period that have been especially selected to celebrate the centennial of the Coptic Art Museum. The museum was founded in 1910 by an influential Copt, Marcus Pasha Simaika, who established it next to the famous Hanging Church in Old Cairo. The Coptic Art Museum was renovated by the Supreme Council of Antiquities (SCA) and reopened in 2006. Culture Minister Farouk Hosni said Coptic Art Revealed was the first locally- curated exhibition on Coptic art. It focuses on the splendours of the Coptic era and highlights the Copts' outstanding contribution to Egypt's diverse and rich heritage. Soft, classical tunes filled the evening air at the open court of the Mamluk-era Al-Amir Taz palace, as light, winter breeze frisked the dimly-lit trees. The atmosphere was serene and enchanting at of the grand opening of the Coptic Art Revealed exhibition, celebrating the centennial of the Coptic Art Museum. Founded in 1910 by an influential Copt, Marcus Pasha Simaika, the museum was built next to the famous Hanging Church in Old Cairo. The Museum was renovated by the Supreme Council of Antiquities (SCA) and was reopened in 2006. The exhibition displays 205 objects that were put in a dramatic-themed setting, revealing the splendour of Coptic art and shedding light on Copts’ outstanding contribution to Egypt’s divers and rich heritage. The exhibition takes guests on a voyage back to early Christianity, when the holy family fled to Egypt. It also shows how this new religion survived among other old religions, illustrating the overlap of Pharaonic, Craeco-Roman and early Christian motifs. A vast list of texts available online at Duke, including Roger S. Bagnall's The Florida Ostraka: Documents from the Roman Army in Upper Egypt (1976) and Ari Z. Bryen's Visibility and Violence in Petitions from Roman Egypt (2008). Summary of research presented in Current Anthropology. A British researcher has published a startling new theory that the remains of untold ancient settlements from a 100,000-year stretch of human history were submerged by the rapidly rising waters of the Persian Gulf around 6,000 BC — the result, in all likelihood, of a catastrophic, planetwide flood triggered in Canada. There's a consensus among scientists that the collapse of a kilometres-high glacial dam at the end of the last ice age caused a massive outflow of meltwater into the Arctic or North Atlantic Ocean near Hudson Bay, generating a sharp rise in sea levels around the world and profoundly altering the Earth's climate. Some scientists have even speculated that ancient myths about great floods — culminating in the biblical story of Noah's Ark — were inspired by the worldwide deluge. But the new theory, advanced in the latest issue of the journal Current Anthropology by University of Birmingham archeologist Jeffrey Rose, offers the clearest picture yet of what may have been lost at the Middle East nexus of human civilization when Canada's super-sized Lake Agassiz — a remnant of which is today's Lake Winnipeg — suddenly burst its banks 8,000 years ago. The resulting rise of the Indian Ocean flooded a Great Britain-sized expanse of the Arabian Peninsula that had previously been above water and was almost certainly inhabited by ancient peoples for as long as 100 millennia, Rose stated. The rising water created the present-day Persian Gulf and drowned shorelines around the peninsula, along the northeast coast of Africa and elsewhere around the world. 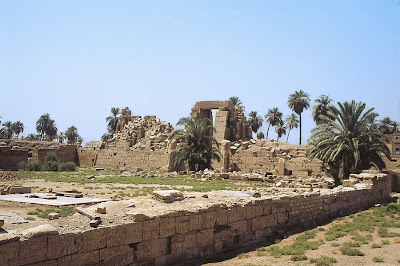 Just a one-and-a-half-hour drive south of Luxor lies El Kab, one of the oldest settlements in Upper Egypt and home of the vulture goddess Nekbet. Archaeologist Salima Ikram of the American University in Cairo calls the city, known as Nekheb in ancient times, a "jewel of a site." The Site Approaching El Kab from the Nile side, visitors first encounter the massive mud-brick walls that enclose a square area of roughly 125 acres. Inside this enclosure are the remains of various domestic buildings and two temples, one dedicated to Nekbet and another to Thoth, the god of wisdom. 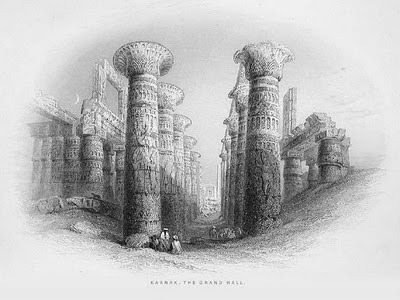 Both temples date to the New Kingdom period (1550–1069 B.C.). The tombs at El Kab are also interesting. They have walls carved with important texts referring to the naval battles on the Nile between Egyptian forces from the city of Thebes and the invading Hyksos armies from the Near East. Ikram's favorite place is the Tomb of Paheri, who was mayor of Nekheb during the 18th Dynasty (1550–1295 B.C.). 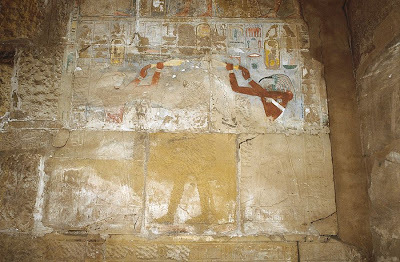 In this tomb are well-preserved paintings of Paheri's funeral procession and images of pigs, rarely seen in Egyptian tombs. Mummies decaying in Siberia, pyramids vanishing under the sand in Sudan, Maya temples collapsing: climate change risks destroying countless treasures from our shared past, archaeologists warn. . . . Sand is one of the worst enemies of archaeological sites, like in Sudan where dunes are encroaching on the burial pyramids of Meroe, the capital of a flourishing kingdom from the third century BC to the fourth AD. "In Oman, two cyclones -- Gonu un 2007 and Phet last year -- totally buried in sand sites that date back to the fifth and sixth millennia BC," said Vincent Charpentier, of the INRAP archaeological research centre. Michelet warns that UNESCO's efforts so far to identify at-risk sites do not go far enough, calling for the world to "sound the alert" over the threat. "Archaeology is part of human memory," said Francfort, who suggests radical solutions may be needed to protect past treasures from climate change, citing the case of the Abu Simbel rock temples in Egypt. South facade of the 8th pylon. Mr. Hawass, what are you doing with all the sarcophagi? The US goes to great lengths to work with (and dare I say placate) the governments around the world in the protection of cultural patrimony. We have very close working relationships with the governments of Peru, Egypt, Greece, Italy, China, Ecuador, Turkey, et al in the enforcement and repatriation of items of cultural patrimony. Having been personally visited by our US Customs Department, I can tell you, they take this work very seriously and do not take kindly to American citizens smuggling items into the country – and rightfully so. I have seen photos of many important archaeological sites around the world that have been ransacked by looters. The value of the education and actual artifacts that are destroyed by these common criminals is astronomical. I have seen photos from Peru of huaqueros playing with human skulls in their search for loot, and destroying pieces of lesser interest to get at “the good stuff.” I believe all of us agree this cannot and should not be tolerated. But what about the material that is repatriated, or the items of lesser value currently stored in these countries? I know archaeologists who have had the pleasure of visiting Italian storehouses where Greek Attic and Apulian pottery is stacked almost like kindling, with decorations that are eroding due to lack of proper care. I have heard stories of Egyptian storage basements with completely inadequate humidity control where wooden objects rot or are consumed by rodents. I have been to museums in Lima where the curators complain there is so much material they cannot possibly properly store or care for it all. Is it really better to send all of this material back to countries who clearly cannot properly care for it? “Who built the pyramids?” This is a question that the public still asks me even today. My continuing discoveries at the site of the tombs of the pyramid builders at Giza (first found in 1990) clearly demonstrate that these world famous structures, the last surviving of the Seven Wonders of the World, were built by Egyptian craftsmen and that they were not slaves. If these workmen had been slaves, they would not have been granted the honor of being buried beside their king, in the majestic shadow of their impressive handiwork. A very important discovery was made in the pyramid builders’ cemetery a few months ago. It made me extremely happy! The tombs that were found, as well as the pottery found inside them, were dated by their architectural style to the 4th Dynasty (c. 2639-2504 BC), the period of time when Khufu, the owner of the Great Pyramid, reigned. These tombs are also located very close to the Great Pyramid, indicating that were probably the first to have been built in this area. The tombs are unique. One big, rectangular tomb, built of mud brick and covered with plaster, was found surrounded by smaller tombs. The big tomb belonged to an overseer of one of the gangs of workmen, named Idu, who had his name inscribed on a stele. The Ministry of Culture solicited bids on Thursday from four specialized companies that had won an international competition for carrying out the third and final stage of construction of the Grand Egyptian Museum project. The third stage will include construction of the museum’s main building and inner galleries. Culture Minister Farouk Hosni said that work would begin in February on condition that a company was chosen to carry out the project and following approval from the Japan International Cooperation Agency. He added that different offers would be presented and bid specifications distributed to the four companies for study, after which one of the companies will be chosen to implement the project's third stage. Thanks very much to Kate Phizackerley (News from the Valley of the Kings blog) for pointing out that this programme was on last night! I was only 10 minutes away from missing it when I saw her post. The show was produced by PBS. You can find the Image Gallery for the show (and links to other information about it) on the PBS website. I typed the notes below as I was watching it, which is always a bit of a hit or miss process, so apologies for any vague bits in the summary below. If you watched it please do comment/email with any additions. For a period of over 5000 years tomb raiders have plundered the graves of Egypt’s pharaohs, with one exception - the tomb of the Silver Pharaoh enshrined in a casket of solid silver. Details of its discovery are still largely unknown because the discovery of the tomb came as the world was plunged into WWII. Now the life and times of the Pharaoh Psusennes I are being pieced together. He lived in Tanis at a time when civil war divided Egypt into north and south. Using source material uncovered by the original excavation, the city and tomb have recently been re-examined by archaeologists and a medic has subjected the Pharaoh’s remains to another analysis. In February 1940 Adolf Hitler had advanced into Europe. Egypt was remote from the battlefield but at Tanis in the Delta a French team which had been digging for more than a decade work found that they were under increasing pressure from the approaching war. The excavations were led by French archaeologist Pierre Montet. Montet dug at Tanis hoping to find link with Holy Land. 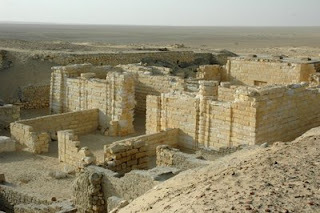 Through the 1930s the team uncovered the remains of vast temple dedicated to Amun, which was protected by massive mudbrick wall in which Montet believed that tombs might be discovered. At a spot close to mud brick wall at south west corner an enormous tomb complex was uncovered, revealing a whole series of burial chambers. But worst fears confirmed during the initial investigations of the first of the clearly royal tombs because there was a hole in the roof which must have meant that tomb robbers had entered it. 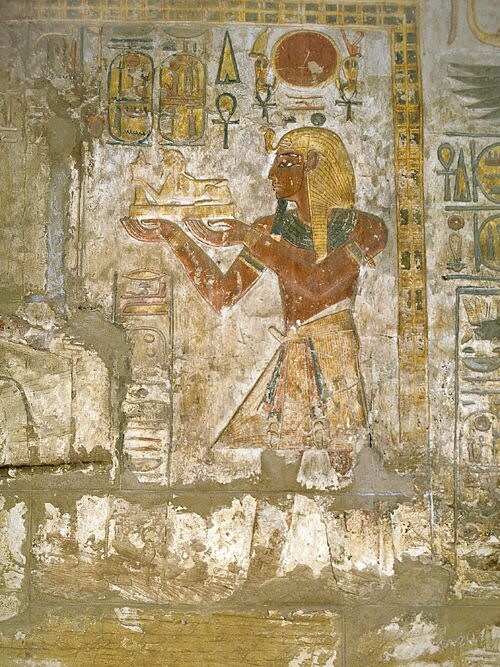 The tomb datd to c.850BC and was the 22nd Dynasty (Third Intermediate period) royal tomb of Osorkon II. Undeterred Montet ordered workmen to extend the excavation to around 10 yards away. A second tomb complex alongside the one that had been ransacked was discovered. On the 15th February the team found what appeared to be an intact tomb., and it is surprising that the tomb robbers missed this when it was so close to its neighbours. Montet entered the antechamber and found the cartouches of the pharaoh Psusennes I, a virtually unknown pharaoh who lived from c.1047-1001BC. The name Psusennes is the Hellenized version. In ancient Egyptian his names were Pasebakhaenniut Aakheperra Setepenamun, meaning "The Star Appearing in the City, Great are the Manifestations of Re, chosen of Amun". He was the son of the founder of the 21st Dynasty, the Pharaoh Smendes (Third Intermediate Period). Psusennes I ruled north of Egypt whilst most of the real wealth and power was concentrated in the south. So who were the northern kings? Montet had the chance to fill out knowledge about this elusive period in the north. The dooorway of the tomb was still tightly sealed with a block of granite when Montet found it, and this took six days to shatter. When the tomb was entered it was “filled with marvels worthy of 1001 knights” – including objects of great beauty and value. At first there was no sign of a mummy or casket because these were sealed within a huge stone sarcophagus which almost fulled the chamber and was both sculpted and covered in hieroglyphs. The lid alone weighed half a ton. Another stone sarcophagus within it was richly carved and it took another six days to remove them to locate the inner casket. The casket was left sealed until the visit on the 28th February of King Farouk of Egypt so that Farouk could witness it being opened. What confronted them when they revealed the final coffin was a solid silver casket which is completely unique. Within the remarkable silver casket Psusennes wore a death mask of solid gold. Also discovered in the tomb were huge quantities of lapis lazuli which was imported from Afghanistan and was very valuable. The value of the objects isn’t just in the precious metals but in the quality of the craftsmanship. The wealth of the tomb, the silver coffin and the golden mask demonstrated that this is no small-time war lord or regional ruler but was an indiviudal of power who commanded considerable wealth. Montet had only days to examine the contents of the tomb because Hitler’s invasion of France was only a short time away. He ordered the tomb to be shut, went back to France and wouldn’t return for five years. The objects were were moved to Cairo Museum for safe-keeping. Douglas Derry (who had analysed the remains of the body of Tutankhamun) was asked to look at the remains of the king in 1940. The remains were very badly damaged because of the wetness of the Delta which decayed the body. The analysis conducted by Derry seems to have been somewhat cursory because he missed a lot of evidence although he pointed out that the Pharaoh died an old man. For 70 years his bones were stored, almost forgotten, but the remains were recently reviewed by Dr Fawzi Gaballah to determine the Pharaoh’s state of health and his lifestyle. All of the soft tissue had gone but the bones indicated that the Pharaoh was 5ft 5, around 13 stone and was powerfully built. He died a very old man, possibly approaching 80 when the average lifespan at the time was usually around 35 years of age. These results were confirmed by examination of his teeth. Psusennes reigned for 46 years, meaning that he ruled long enough to be able to make a difference, one of the longest ruling Pharaohs. One of the Pharaoh’s vertebrae had been fractured in a way that usually indicates hard work with the upper limbs. A forensic artist, Melissa Dring, who has worked with the FBI was set to work on the skull and produced a really evocative image of how he may have looked. You can see it on the National Geographic website. The silver casket was examined by Jon Privett archaeologist and silversmith. Silver is harder and less malleable than gold, requiring it to be heated every now and again to make it continually workable. The craftsmanship was much more demanding than that required for working gold. In all 200lbs of pure silver were used, with some of it formed into sheets so thin and delicate that they were damaged during the removal of the casket. Other parts of it were cast. The silver casket is one of great treasures of Egyptian Museum. The turmoil that existed in the time of Psusennes was seeded under Ramesses II. over 200 years previously. Before Ramesses II the only two cities of importance were Thebes (Luxor in Upper Egypt) and Memphis (near Cairo in Lower Egypt). 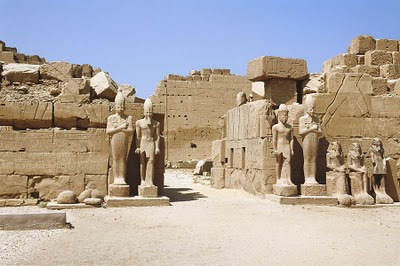 Ramesses II created a new capital in the Nile Delta Piramesse (near Qantir) in a frontier zone. This may have thrown Egypt off balance after his reign. Trouble began in Thebes where the only figure with enough authority to challenge a pharaoh was the high priest of Karnak, a political and business leader. Kings would win the favour of the priests, responsible for care in the afterlife by giving them wealth, and putting them into the position of such power that they were eventually able to challenge the pharaohs for power. A High Priest seized the south and the pharaoh was banished to the Delta, with a checkpoint at Memphis. The High Priest Penedjem (c.1070bc) had four sons one of whom became pharaoh in the north and had the title High Priest in the north and made political marriages and alliances. One of the objects from the tomb of Psusennes indicates that he too was a High Priest as well as a pharaoh and he appears to have benefited from Penedjem's legacy. The exact location of Piramesse was a mystery to archaeologists at the time that Montet was working in Tanis. It had been home to one quarter of a million people but no-one could find it. Montet began to think that Tanis was Piramesse and went on record to say so, mainly because he found stones with the names of Ramesses II at the site. But Montet had made a mistake. His theory sounded good because Tanis was a riverside city which records show Piramesse was too. But the Nile had many Delta branches and they moved over time due to flooding and siltation and Montet's findings were eventually questioned. Instead 15 miles away new evidence pointed to a long lost branch of the Nile where Ramesside pottery was found and Ground Penetrating Radar was used which found the foundations of a huge city complex, complete with temple, military installations, stables, and vast numbers of other structures. Under the crops of today was an ancient city. It is thought that the Nile became so badly silted up that it switched direction, leaving Piramesse literally high and dry and completely unsustainable. So Psusennes had the great temples dismantled and moved 15km away to Tanis, an amazing feat, demonstrating his organization and authority. The story is put into context with a brief history of Egypt from the beginning giving key dates which is useful. the show highlights problems filling gaps in timeline, particularly during the so-called Third Intermediate periods (which the show simply calls the "intermediate period") and the problems that those gaps cause for archaeologists in terms of the evidence needed to construct histories. The show also gives a brief description of relationship between Egypt and holy land. Although actors are used to dramatize some of the narrative, this is confined to the archaeological investigations and there aren't any of those infuriating reconstructions of the Pharaonic period that so many shows insist on making. The account of the discovery of the tomb is excellent, and the details about the pharaoh which resulted from the new examination of the body are on considerable interest, but there is remarkably little information about the Pharaoh in the context of Tanis and the role that Tanis played, or how Psusennes actually accumulated his wealth. There is also nothing about where the silver and gold were sourced. It would have been interesting to know what, if any, the relationship (political, social, economic) was with Upper Egypt during his reign. I found the absence of how Lower Egypt actually functioned during his reign to be the most frustrating part of the show. There are very few images of the finds from the tomb, or the tomb itself, which is a real shame. Even the footage of the silver casket weren't brilliant. This is a real downside of the show. On the other hand there are lots of of great images and footage of Tanis and some lovely GPR images of the Piramesse city beneath the fields of crops. There are, as usual, far too many comparisons with Indiana Jones!! Documentary exploring the life of one of Egypt's forgotten pharaohs as historians take a fresh look at Psusennes I's remains, which were found intact by Pierre Montet in 1940. The discovery of the mummy encased in an unusual silver casket was overshadowed by the Second World War, but experts now hope to learn more about the powerful ruler and shed light on a murky period of Egyptian history. A somewhat fragmented piece of writing, but it suggests that ancient Egyptian artefacts have been found in the Stavropol area of Russia from the time of the ancient Silk Road, and were transported there by Silk Road merchants. Stavropol is located south of the European Russia or Central Caucasus. The region is commonly known as Kavkazskie Mineralnye Vody (Caucasian Mineral Waters). Archeologists in Stavropol Territory have found evidence that the region was opened up by merchants of the ancient Silk Road. One of latest archeological finds is a bronze mace, which served as a weapon in different tribes. Three Sarmatian burials were found in a barrow that is cleared not far from Pyatigorsk. Besides, the specialists found ceramics, bronze items, and faience ornaments, which were unearthed from a burial place of a teenage girl. The finds are about three thousand years old. According to archeologists, the most interesting of the artifacts are a fragment of a bronze mirror, and beads made of faience – they had been brought there from Egypt. It is another confirmation to the fact that the region of Caucasian Mineral Waters (aka Stavropol Region) was known to merchants on the Silk Road. Thanks to Jan Picton for announcing that this year's book auction raised 6,300 uk pounds for the current conservation project of the stone reliefs and inscriptions in the Petrie Museum of Egyptian Archaeology. All the books were donated by both members and non-members in aid of the valuable conservation project. The auction will run again next year so if you have any unwanted books about Egypt or the Near East do keep the Petrie in mind! The entrance to the 7th Pylon. It sits beyond the so-called Court of the Cachette where a huge collection of statues was discovered in 1903. AN Egyptian relic dug up in a Derby back garden has been valued at £10,000. The owner of the item, a stone bust shaped as a pharaoh, appeared on the BBC’s Antiques Roadshow where the item was valued by antiques expert Henry Sandon. Asked how he came across the item, the owner, who did not want to be identified, said: “I was doing some gardening when I hit it with my spade. He did not know how the relic came to be in his back garden. Mr Sandon said the bust originated from around 1700BC to 1750BC. He added: “It is absolutely beautifully made. It possibly did have a beard and a nose and over time these have fallen off. It’s true. That very British-sounding St. Ives conundrum (the one where the seven wives each have seven sacks containing seven cats who each have seven kits, and you have to figure out how many are going to St. Ives) has a decidedly archaic antecedent. The goal: to determine how many things are described. The answer: 19,607. The Rhind papyrus, which dates to 1650 B.C., is one of several precocious papyri and other artifacts displaying Egyptian mathematical ingenuity. Racial profiling and manipulation have been around for a very long time. It has become an issue in contemporary politics, and over 2500 years ago the Greek historian Herodotos wrote that ethnicity was regularly turned to political ends. Cleopatra VII, the last queen of Egypt and a woman of great ability, is often a victim of racial profiling, as today people can be more interested in her racial background than her many accomplishments. Such concerns have recently come to the forefront with the announcement that in at least one of the several Cleopatra movies currently planned, a white (instead of black) actress would play the role of the queen. It is hard to imagine that race would be more important than acting ability, but clearly others disagree. It has been suggested – although generally not by credible scholarly sources – that Cleopatra was racially black African. To be blunt, there is absolutely no evidence for this, yet it is one of those issues that seems to take on a life of its own despite all indication to the contrary. What follows lays out the evidence for Cleopatra’s racial ancestry, but one must not forget that this is of little importance in assessing the legacy of the queen in world history. Let us consider exactly the evidence for Cleopatra’s racial background. It’s a little complicated, so do follow closely! Minister of Culture, Farouk Hosny and Dr. Zahi Hawass, Secretary General of the Supreme Council of Antiquities (SCA) are organizing a press conference on Wednesday, December 8th at Al-Amir Taz Palace to announce the opening of the Coptic Art Revealed exhibition. The exhibit displays over 200 artifacts from the Coptic era and was organized to celebrate the centennial of the Coptic Art Museum, which was renovated and reopened in 2006. The photography exhibition, A Secret Voyage: A Journey Into the Realm of the Pharaohs will open on Sunday, December 12 at 6 PM at the Egyptian Museum. The exhibition features the photography of Sandro Vannini, and focuses specifically on images used in the limited-edition volume A Secret Voyage: Love, Magic and Mysteries in the Realm of the Pharaohs by Zahi Hawass. This exhibition is the culmination of five years worth of work by Mr. Vannini in the Theban Necropolis, particularly in tombs that have long been closed to the public. Nothing to do with Egypt, but if you have just purchased CS5 you will need to download free bug fixes at the above page. A close up of one of the unusal column capitals in Tuthmoses III's Great Festival Temple. Original colour shows some of the decoration. Naukrtis, a Greek trade emporium on Egyptian soil, has long captured the imagination of archaeologists and historians. Not only is the presence of a Greek trading settlement in Egypt during the 7th and 6th century B.C.E. surprising, but the Greeks that lived there in harmony hailed from several Greek states which traditionally warred amongst themselves. The Greeks that inhabited Naukrtis, explains Dr. Fantalkin, may have come from warring city states at home, but they formed a trade settlement in Egypt under the protection of powerful Eastern empires. The December 2010/January 2011 issue of “Ancient Egypt” magazine (published in the U.K.) is now available. The online version may be especially useful for anyone overseas with a broadband connection who may have difficulty in getting hold of a paper copy of the magazine, or who might want to see a copy before subscribing. News from Egypt and the World of Egyptology: Our regular special report ‘From our Egypt Correspondent’ brings the latest news and information – you won’t find this anywhere else! This issue includes reports on new work/discoveries at El-Alamein, some Islamic monuments and the Islamic Museum in Cairo, and Luxor. News from the Editor: with news recent events and of the restoration of two ancient Egyptian baboon statues at Cliveden in Buckinghamshire. Early Explorers of Egypt’s Western Desert: Peter Stevens follows in the tracks of the first Europeans to travel in the Western Desert, a journey that is still difficult today. Replicating and ancient Egyptian masterpiece: AE reveals that ancient skills have not been lost and follows the work of a modern Egyptian Craftsman in making a copy of Tutankhamun’s gold throne. Wonderful Things: AE visits an exhibition of full scale replicas of objects from Tutankhamun’s tomb, “Tutankhamun, His Tomb and His Treasures”, which opened recently in Manchester. The Department of Ancient Egypt and Sudan at the British Museum: In the last of a series of articles on the work of the Department, Elisabeth R. O’Connell looks at the Late Antique objects from Egypt and how and where they were collected. Replicating Tutankhamun’s Tomb: AE looks at how a Spanish company Factum Arte, is using the latest technology to create a perfect copy of Tutankhamun’s Tomb, as a way of helping to preserve the original. An Egyptophile in Egypt: Laura Ranieri offers tips, tactics and practical information to the tourists visiting Egypt for the first time. PerMesut: in our regular feature for younger readers, Hilary Wilson asks, “What’s in a Name?” (Part 2). Net Fishing: Our regular look at Egyptology on the Web, tracing the history of ancient Egypt. This issue Victor Blunden looks at the 25th Dynasty. The Akhenaten Colossi of Karnak, by Lise Manniche. The Nile Cruise, by Jenny Jobbins. The Pharaoh’s Kitchen, by Magda Mehdawy and Amr Hussein. Myths and Legends of Ancient Egypt, by Joyce Tyldesley. City of the Ram-Man: The Story of Ancient Mendes, by Donald B. Redford. For the Living and the Dead: The Funerary Laments of Upper Egypt, Ancient and Modern, by Elizabeth Wickett. The Shabti Collections 1, by Glenn Janes. Tutankhamun, His Tomb and His Treasures, various contributors: the guide to the exhibition in Manchester. Tutankhamun’s Funeral, by Herbert E. Winlock, introduced by Dorothea Arnold. Egyptian Museum and Papyrus Collection in Berlin: 100 Masterpieces, by Dietrich Wildung, Fabian Reiter and Olivia Zorn. The Fortifications of Ancient Egypt, 3000-1780BC, by Carola Vogel. Auguste Mariette: Chris Humber tells the story of the Founder of the Egyptian Antiquities Service and of the Egyptian Museum in Cairo. Misdemeanours at Deir el Medina, Benedict Davies looks at the life and times of the occupants of the Workmen’s village. Why Belzoni went to Egypt: Bill Key reveals the real reason Belzoni first went to Egypt. Tutankhamun’s Khepesh Swords: by military expert Mike Loades. Re-excavating Egyptian Predynastic sites in London : G.J Tassie and Joris van Wetering explain how some Predynastic objects came to be in London and their recent return to Egypt. And… Egyptomania in China and also in St. Helier, Jersey. Plus full Egyptology Society listings and UK lectures from December 2010 to February 2011 and listings of exhibitions and the many Egyptological events which will be taking place in the Winter months in the UK. Overseas Egyptology Societies are also listed. With some great photos of car parts! I'm back in Egypt for a week or so of field work in the Western Desert. We had an entertaining day last Thursday trying to get from Alexandria to El Kharga, an oasis town in the center of the western desert of Egypt. I gave a talk to the Geology Department at Alexandria University on Thursday morning, and literally 10 minutes after my talk was over, we piled into a robust but somewhat aging 4WD Toyota for what was supposed to be about a 10 hour drive to El Kharga. The Desert Road from Alexandria (on the Mediterranean) to Asiut (on the Nile) runs south from the Delta just west of the Nile floodplain and parallel to the Nile. The N-S Desert Road intersects the NE_SW road from Asiut to El Kharga just west of Asiut. The plan was to turn SW onto the Asiut-Kharga Road and arrive in El Kharga about 10 pm. "The crew" consisted of Dave, a grad student of mine from Alexandria University, two geologist colleagues, and our driver Samir. And lots of field gear. Things went swimmingly along the Desert Road. It got dark, and we stopped to get gas at the intersection with the Asiut-El Kharga Road. When we got back into the Toyota, it wouldn't start. So, we gave it a push start and headed down the road. About 10 km down the road, the engine started to run badly, and the only way for Samir to keep the engine going was to drive without the headlights on and flash them every little while to see where the road was. It was completely black out - no moon. Because we couldn't speak Arabic, we couldn't understand the exchange between Samir and one of the geologists, and Dave and I were getting a little panicky considering that we still had about 300 km to drive to El Kharga and we thought that Samir was going to drive all the way to El Kharga that way. A nice idea from Manchester Museum is their online Advent Calendar, featuring some lovely objects from the collection. There are items from the entire collection but there are some Egyptian items featured in amongst a good selection of objects. 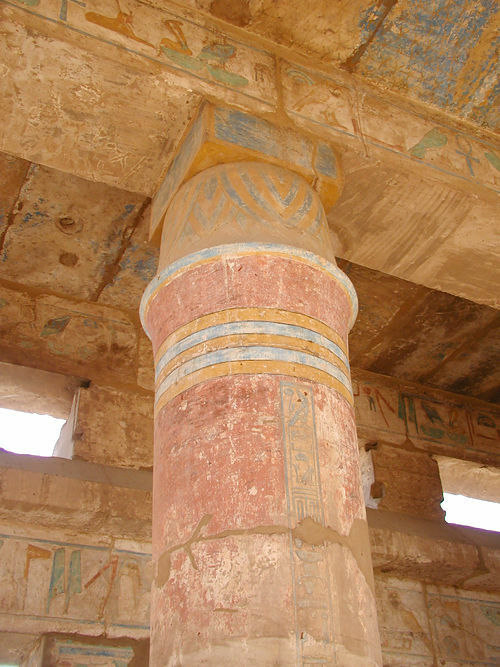 A pillar in Tuthmose III's Hall of Records. Made of granite it bears a Paprus plant symbol of Lower Egypt. Text and photo copyright Jon Bosworth, with my sincere thanks. A temple built by Ptolemy II Philadelphus has been discovered at the ancient city of Thmuis (also known at Tell Timai) on the Nile Delta in Egypt. Ptolemy II was a king of Egypt and the son of one of Alexander the Great’s generals. During his reign Egypt had a vast navy and controlled harbours and territory throughout the eastern Mediterranean. He erected a stela (a stone carving) at Thmuis and inaugurated a building and restoration program in the city. Archaeologists believe that the newly discovered temple may have been built as a memorial to his dead queen – Arsinoe II. She was held in such high regard that the king deified her after she died. See the above page for more. Scientists are still trying to explain how the gray wolf could evolve into over 400 breeds of dogs, ranging from the pug to the pinscher. One aid in solving this riddle has been found in an unlikely place: a giant animal shrine from ancient Egypt. At first, he panned for gold in the East Indies. Then he poked around in Stonehenge. And then, during his forays into the Orient, he discovered mankind's oldest legal codes. Later, in 1897, French adventurer Jacques de Morgan found himself standing in a dark crypt in Egypt, knee-deep in bones that crackled and snapped with every step he took: He had discovered the world's largest dog cemetery. De Morgan's pioneering discovery was soon forgotten in professional circles. But now, more than a century later, researchers from Cardiff University, in Wales, have turned their attention to the dog mausoleum once again and are conducting excavations at the site. Paul Nicholson, a lecturer in archaeology from the university who is leading the dig, says that thousands of mummified dogs were once placed into niches in the cavern. The world of Cleopatra VII, which has been lost to the sea and sand for nearly 2,000 years, will surface in Cincinnati on February 18, 2011 when “Cleopatra: The Search for the Last Queen of Egypt” opens its doors. Cincinnati Museum Center was selected as the second stop in the world for the exhibition tour. Tickets for the exhibition go on sale today. On view at Cincinnati Museum Center through September 5, 2011, the exhibition features nearly 150 artifacts from Cleopatra’s time and takes visitors inside the present-day search for the elusive queen, which extends from the sands of Egypt to the depths of the Bay of Aboukir near Alexandria. The exhibition is organized by National Geographic and Arts and Exhibitions International, with cooperation from the Egyptian Supreme Council of Antiquities and the European Institute for Underwater Archaeology (IEASM). It features statuary, jewelry, daily items, coins and religious tokens that archaeologists have uncovered from the time surrounding Cleopatra’s rule, all of which are visiting the U.S. for the first time. The second part of Keith's article Hemienu to Houdin, part of a superbly illustrated series looking at different theories of pyramid construction. Part A can be found here. In Hemienu to Houdin: Phase One, Part A, we looked at how Jean-Pierre Houdin proposes Hemienu could have built two thirds of the Great Pyramid with a straight, external ramp that only reached one third of the total height of the pyramid. We also outlined how the ramp would have been three ramps in one, or rather, a ramp of three lanes, two of which alternated from level to level. In Phase One, Part B, we will be taking a detailed look at how the alternating lanes functioned, and how Jean-Pierre thinks Hemienu would have changed his strategy once the ramp became too narrow to accommodate two lanes, while still maintaining uninterrupted work from level to level. Madrid is host to a three dimensional exhibition called “Tutankhamon the tomb and his treasures” where visitors can learn more about the life and death of this young pharaoh by means of the reproductions of these objects created by Egyptians craftsmen. Madrid's Casa de Campo is host to a life-size replica of Tutankhamon's tomb, in a new concept of exhibitions and for the first time in 88 years the tomb and its treasures have been recreated three-dimensionally in their original form. The exhibition offers visitors the opportunity to know how the archaeologist and Egyptologist Howard Carter worked relentlessly until he uncovered the tomb in 1922. After generations tucked into a small room on the first floor of Gilman Hall, The Johns Hopkins University's archaeological collection has emerged from seclusion. Ancient sculptures, pottery, jewelry, weapons and tools from the Americas to the Middle East will now get their moment in a mix of sun and cool museum light that illuminates an expanded new display space after an $85 million renovation. The collection marked its opening day Sunday with lectures, lunch and a cocktail reception, and with a new, more dignified name: The Johns Hopkins Archaeological Museum. "Up until a few years ago we called ourselves a collection," Betsy M. Bryan, director of the museum and Alexander Badawy professor of Egyptian art and archaeology, told a morning gathering that opened the day's celebrations. "Now we feel confident in calling ourselves a museum." I've more or less given up on travel stories because they are all pretty much the same, but this one may be of interest to those who have children and are planning to take them on a visit to the Nile valley. The solution of these parents was to split the holiday between the Nile Valley and the Red Sea coast. A friend back home had warned us against making the standard assumption about our children's behaviour; a school project on Howard Carter or a passing interest in Cleopatra is no kind of preparation for the heat, crowds, accented commentaries and plain hassle that trailing around Egypt's antiquities tends to entail. "One pylon in," the friend promised, "one statue of Horus and they'll be turning fractious." We plan our holiday accordingly, the two generations taking part in tough horse-trading to negotiate a settlement. The parents will have their time in Upper Egypt, getting their hit of antiquities, as long as the children get their spell on the beach. Until last year, this would have meant submitting to the delay-prone military convoy whereby all visitors were ferried between the Nile Valley and the Red Sea. With the recent lifting of that particular aggravation, amid a general easing of the region's security situation, our two-centre arrangement merely entails a straightforward transfer across the Eastern Desert. Trivia: The Xmas gift for the Egyptomaniac who has everything? No matter what technology produces, one form of entertainment will remain timeless. For centuries, board games have held the title of perfect pastime. And, while the games seem perennial in their current form, combining technology with a classic formula could just produce a unique new experience. The Khet Laser Board Game hopes to give players a new twist on a familiar formula. Two players play this Egyptian themed board game. One takes command of the red pieces while the other commands the white. Players are given a “pharaoh” piece, obelisks pieces and pyramid pieces. Each turn players must protect their pharaoh piece while moving other pieces around the board. Sure, this sounds a lot like chess but it quickly becomes apparent that this is no chess. Just beyond the 6th Pylon a wall has been reconstructed in a small chapel. A relief shows Horus on the left and Thoth on the right. The central figure of Hatshepsut and her cartouches have been erased. Another installment in the excellent series from the Brooklyn Museum which gives a real insight into the detailed work carried out by museums. With photographs. Following Rachel’s previous discussion on pigments and inks used in our Book of the Dead of the Goldworker of Amun, Sobekmose, I will begin here our discussion of the different examination and analytical techniques we employ in conservation and the ones used on this object in particular. I will start with two imaging techniques: infrared reflectography and ultraviolet fluorescence photography. We typically use traditional photography to record images of artifacts in the visible light spectrum; this way we record on a digital file that which the human eye can see (fig.1). However, this technique can provide only a limited amount of information, since the visible portion of the electromagnetic spectrum is a very small portion (400-700nm) of the entire spectrum. By eliminating the visible light using barrier filters, we are able to record images that the unaided human eye could not detect. In wintery, snow-covered Durham preparations for the coming season of work in the cemetery are underway, with only six weeks left until the new season starts. During January and February, we will return to Cemetery C, the post-New Kingdom necropolis first excavated in 2009. The international team of three archaeologists – including myself and two new team members from the UK and Canada – all specialise in the excavation of graves and human remains. This is crucial because we are likely to encounter complicated multiple burial situations, and only archaeologists with experience and understanding of human skeletons are able to recover all of the evidence. For example, the way in which individual bones lie when discovered can indicate whether the bodies were disturbed shortly after burial or later, after the soft tissue had disappeared. Thanks to Jane Akshar's Luxor News blog for the news that the late 2010 season at the funerary complex of Harwa has started. A dig diary has just been started, in Italian, on the Harwa.it website. The Harwa website also has loads of information about the site, which has been excavated since 1996, in English, accompanied by lots of photographs.